This special baby card is the most beautiful card in the world. Just ask any grand parent and they will tell you that it's true. Lauren went for her first scan on Tuesday afternoon and came straight over to show me the scanned image. Baby Anderson is 12 weeks and 1 day out of 40 weeks keeping warm by my Daughter Lauren. This is Laurens first baby and she just can't wait. 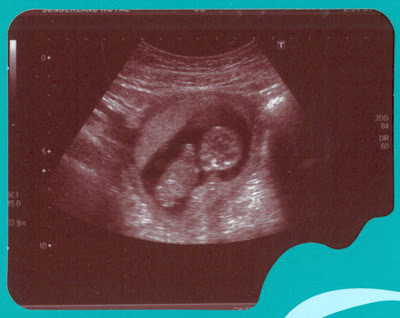 During the scan they noticed that Lauren has got a double Uterus. If you click on the large scanned image you can even see the baby's eyes. How sweet. God bless your daughter and her baby. Best wishes for a healthy pregnancy, and quick delivery at 40 weeks. That is so cool. I'm so glad that you can share all this with your daughter! That is so special. oh thats lovley. I bet the grandparents are just as excited. I hope lauren has a healthy pregnancy. How wonderful it is to see the baby so clearly. Good job it wasn't too clear. Thank you for sharing a special moment. I think it marvellous that you can actually see your new g/child before you can kiss and cuddle it. HOw lovely it is now adays to see baby before it arrives a real thrill for you all thanks for sharing it. Hope Lauren and baby continue to thrive. As you say, the most beautiful image in the world for you, may this baby bring you all much joy. Congratulations to Lauren and partner. Beautiful picture Jak and one to really treasure. I've got copies of the scans of all of my 5 grandchildren. They're amazing. Oh Wonderful!!! how gorgeous!! God bless you all Jak - what a precious little person - many thanks for sharing!! Congratulations!! - thank you for sharing such a precious time with us. Best wishes for a healthy pregnancy. Jak thanks for sharing, treasure this picture and best wishes to your daughter for a healthy pregnancy. Oh Jak. What a wonderful, wonderful picture and card. My, how things have changed! When I went for my scans (back when Adam was a lad! ;o) )there was a big notice on the wall stating to not ask the radiographer any questions about the baby, as they would not be answered! Thank goodness that times have moved on. Love and best wishes to your daughter for a healthy and enjoyable pregnancy. Congratulations! Lovely news and a lovely picture! Wishing you all lots of luck. Jak that is just so special and thanks for sharing it with us. Bet you cant wait for the birth, there is just nothing quite like being a nana. How lovely Jak, I also lost someone close to me in October my dear brother, A few weeks later we found out that I am to be a nannie for the first time, Its strangehow you can loose a close member of the family and soon after a new family member is on it way, It sure helps to easy the pain. Oh Jak, isn't that scan wonderful and thank you so much for sharing it with us. This is such a personal thing and i feel blessed you could share it. Wonderful picture Jak, and very clear. Really exciting for you all. CONGRATULATIONS Jak, can't wait to see the cards you make for your new grandchild. Thanks for sharing Jak, magical!!!! Jak - i love that they put the scan in a little card -a great way to save it as well as see it. Prayers that everything turns out well - all happy and healthy. oh jak im so happy for you all being a grandma is even better than having your own as your not so stressed hope your daughter is keeping well thanks for sharing this precious time with us. OH JAK! This is so wonderful! HUGE BLESSINGS AND CONGRATS! Congrats!! What great pic's of the baby. Praying for a happy healthy little bundle! Thank you for sharing this wonderful time with each of us, you are truly an exceptional person. This child is really the light at the end of the tunnel, I know how proud I felt when I was presented with our first grandchild, mucky sweaty and covered in birth fluid, and that was only me, not really, but it was a good time. I will pray for a sweet birth for both of them.